Electrons moving in certain solids can behave as if they are a thousand times more massive than free electrons, but at the same time act as superconductors. A new study led by Princeton scientists shows that this happens because of a process known as quantum entanglement that determines the mass of electrons moving in a crystal. The discovery can help improve understanding of how certain materials become superconducting, which may have applications in areas such as power network efficiency and computing speed. The concept of "heavy" electrons seems counterintuitive. The tiny particles flit through silicon chips to process information rapidly in digital electronics, and they flow with ease through copper wires carrying electricity to your desk lamp. But the Princeton research has revealed that a hard-to-measure process known as quantum entanglement determines the mass of electrons moving in a crystal and the delicate tuning of this entanglement can strongly alter the properties of a material. Cool the electrons to far below room temperature in certain types of solid materials, and these flighty particles gain mass, acting like much heavier particles. Surprisingly, further cooling close to absolute zero makes these solids become superconducting, where the electrons, despite their heaviness, make a kind of perfect fluid that can flow without wasting any electrical power. In a study to appear in the June 14 issue of the journal Nature, the Princeton-led team, which included scientists from Los Alamos National Laboratory (LANL) and the University of California-Irvine, used direct imaging of electron waves in a crystal. The researchers did so not only to watch the electrons gain mass but also to show that the heavy electrons are actually composite objects made of two entangled forms of the electron. This entanglement arises from the rules of quantum mechanics, which govern how very small particles behave and allow entangled particles to behave differently than untangled ones. Combining experiments and theoretical modeling, the study is the first to show how the heavy electrons emerge from such entanglement. Observations made over the last 30 years indicate that electrons in certain solids behave as particles with masses hundreds to thousands of times larger than that of electrons moving freely in a vacuum. 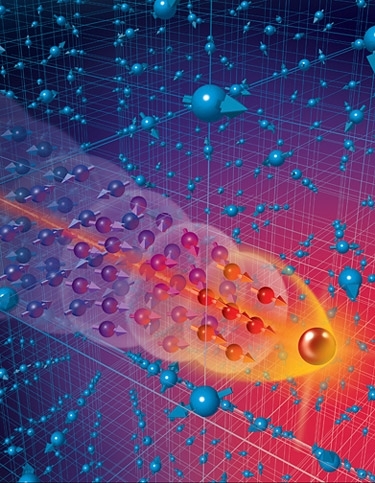 Until now, however, researchers had been unable to understand how this happens and lacked the tools to explore the connection between this process and the superconductivity of heavy electrons. The published study comes after several years of setting up the precise experimental conditions needed to visualize these heavy electrons. The team employed a custom-designed cryogenic scanning tunneling microscope (STM), which allows visualization of electron waves in a crystal. The researchers used the STM to look at crystals prepared in such a way that their surfaces contained a few atomic imperfections. As they lowered the temperature in the experiment, the researchers saw the emergence of patterns of electron waves spread around the defects in a way similar to how ripples of water form around rocks in a pond. "It is remarkable to watch electrons moving in a crystal evolve into more massive particles as we cool them down," said Ali Yazdani, a professor of physics at Princeton and head of the team that conducted the study. Making this groundbreaking observation of electrons as they transition from light to heavy particles is only part of the story. The researchers also showed how the process can be understood based on quantum theories of electron behavior. Subatomic particles such as electrons can exhibit strange behavior because of quantum entanglement, which can mix diametrically opposite behaviors together. By comparing the data with theoretical calculations, the study shows that heavy electrons emerge from entanglement of two opposite behaviors of electrons, one in which they are localized around individual atoms and the other in which they are hopping freely from atom to atom in the crystal. "This is the first time we have a precise picture of formation of heavy electrons, thanks to our ability to probe them with high resolution," Yazdani said. The degree of such entanglement appears to be the key to understanding what the heavy electrons do once they are formed and cooled even further. Adjusting the crystal composition or structure can tune the degree of entanglement and the heaviness of electrons. Make the electrons too heavy and they freeze into a magnetized state, stuck at each atom in the crystal while spinning in unison. But tweaking the crystal composition so that the electrons have just the right amount of entanglement turns these heavy electrons into superconductors when they are cooled. "What is neat, and our studies confirm this, is that you really need to be on the verge of these two kinds of behaviors — sluggish and speedy — to get superconductivity," Yazdani said. "That is the circumstance most favorable to occurrence of heavy electron superconductivity." Understanding superconducting behavior of exotic electrons is at the forefront of research in physics, where there are many examples of magnetic materials that turn superconducting with subtle changes in their composition or crystal structure. The experiments may help physicists unravel the mysteries of high-temperature superconductivity, said Subir Sachdev, a theoretical physicist at Harvard University who was not involved with the work. Many physicists have argued that understanding this transition between magnetism and superconductivity, known as a quantum critical point, could help explain why the materials are superconducting. But physicists have lacked experimental evidence to prove their ideas. "We have been waiting for observations like this for many years, so it is very exciting that such a beautiful experimental system has been found and characterized so well," Sachdev said. The research was primarily supported by the U.S. Department of Energy's Basic Energy Sciences program. Additional support came from the National Science Foundation's Materials Research Science and Engineering Center program through the Princeton Center for Complex Materials; the W.M. Keck Foundation; and the Eric and Wendy Schmidt Transformative Technology Fund at Princeton. In addition to Yazdani, Princeton scientists on the team included postdoctoral scientist Pegor Aynajian and graduate students Eduardo da Silva Neto and András Gyenis. The team also included Ryan Baumbach, Joseph Thompson and Eric Bauer from LANL and Zachary Fisk from UC Irvine.